If you are used to holidaying in the UK, you will be familiar with the age-old conundrum of what to do when it’s tipping down with rain and you are ensconced in a small space with the potential for a boredom-induced family squabble. You will probably also be familiar with the arsenic hours of Sunday afternoon when all homework has been done (finally) and the kids are kicking their heels and getting fractious. 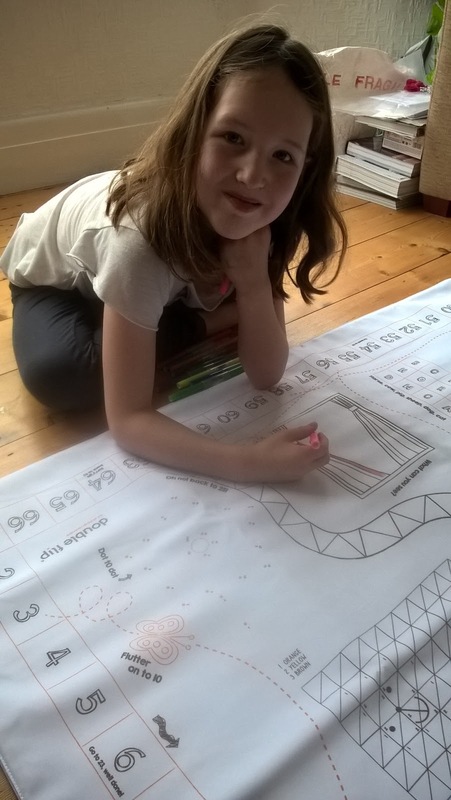 It’s called The Double Flip Fun Games Mat from what2buy4kids.co.uk and it’s a reversible play mat which offers kids a range of activities to choose from. 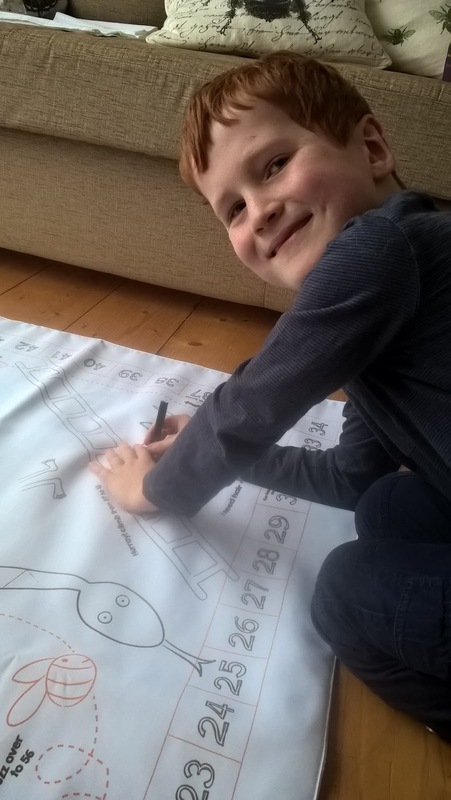 The kit contains the reversible games mat and five dice, six counters and ten washable felt tips so the kids can play with their friends (1-6 players). The mat is a decent size, measuring 120 x 100cm and there is also a fabric carry bag. The suggested age range is 3-10 and best of all the mat is washable so it can be used over and over again. You can wash it at 30 degrees without detergent but don’t tumble dry it. You have to make sure that you only use washable felt tips though. I duly roped in my two crack testers to see if it would keep them occupied for longer than five minutes. 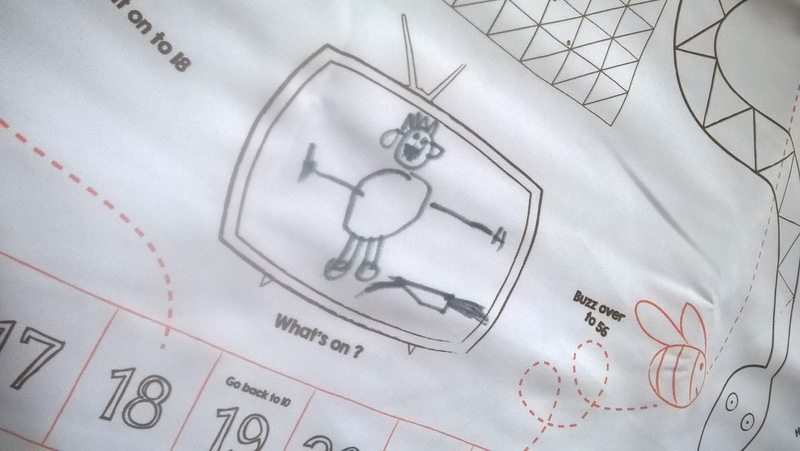 Caitlin, as expected, went straight for the pens to do some drawing whilst Ieuan went for the dot-to-dots. 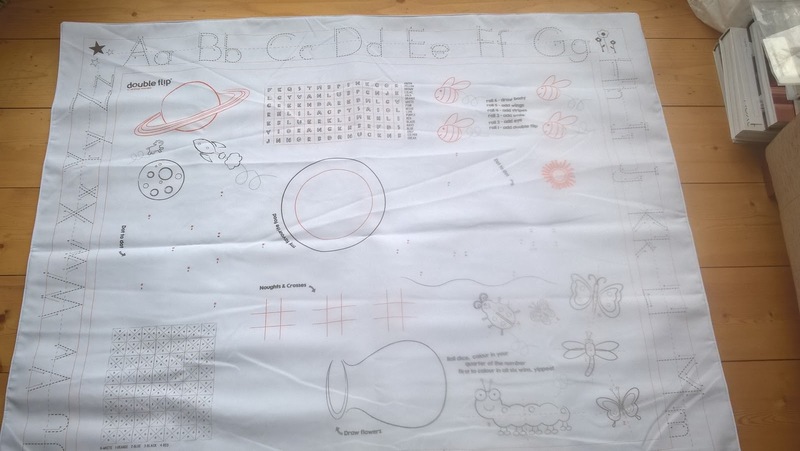 I really liked the range of activities, particularly the educational element – practising drawing letters for example. There are a couple of wordsearches and colour by numbers which are more time consuming activities. I think though that the wordsearches and dot to dots are probably one time only activities, but the colouring aspect and the games could be repeated endlessly. I’d also put the age range closer to 3-8 – I am not sure the games are sophisticated enough for a 10 year old, or at least likely to keep their attention for too long. I also think it depends on how many children are playing with the mat. 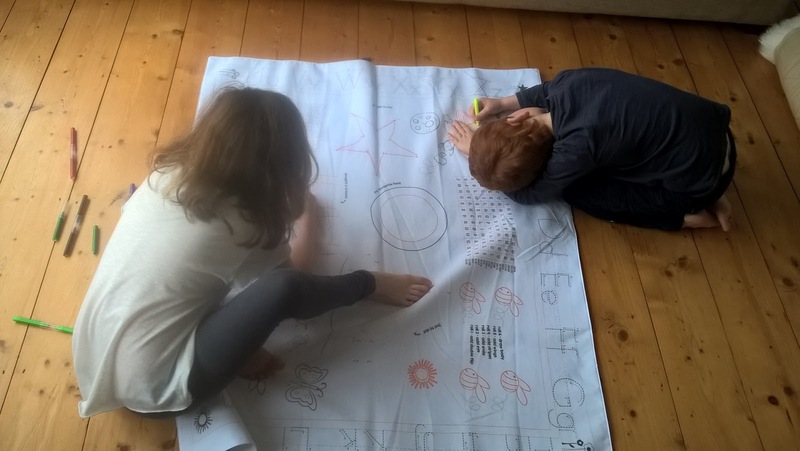 My two are quite competitive and vie to create the best drawing and you can bet they’ll pick the same activity to do which is where having a reversible mat is quite handy. The Double Flip Fun Games Mat is good for keeping kids occupied rather than being a full-on family activity. I don’t think it would replace, say, a board game. But if frazzled parents are looking for a half hour’s peace to read a book (or lie down in a darkened room with a gin & tonic), then it’s ideal. 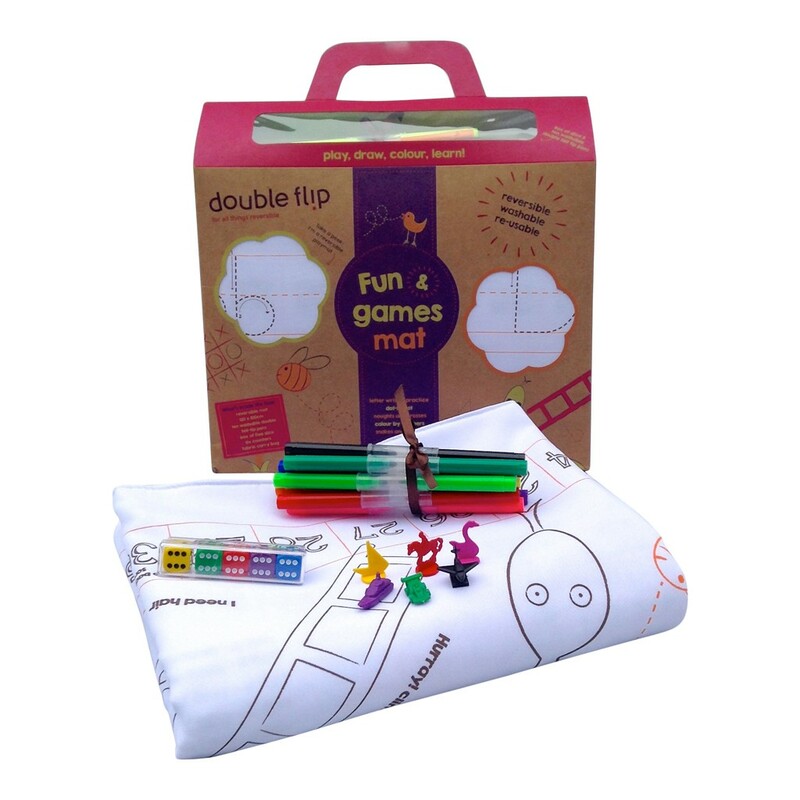 The Double Flip Fun Games Mat is good value at £23.99 given that it has multiple activities and can be reused. It is ideal to sling in your bag to take anywhere you think there might be excessive waiting too – my only comment would be that it does take up some space to lay out. If you’re looking for gifts for kids I think The Double Flip Fun Games Mat would be a welcome present. "Review: Tiana Organics Fair Trade Coconut Oil & Rose Fresh Coconut TLC Anti Ageing Moisturiser"